Progressive-minded activists are calling for North Korean leader Kim Jong-un to visit Seoul promptly to speed up inter-Korean reconciliation. But this has irked some conservatives because the activists are holding rallies where they speak highly of Kim and demand that South Koreans should welcome him in a "respectful manner." On Nov. 18, left-wing activists organized a rally at Gwanghwamun Square in downtown Seoul. The rally was the second of its kind since the group was launched on Nov. 7. The group, roughly translated as the Committee for Paektu Praise, is named after the Mount Paektu bloodline, a three-generation lineage of North Korean leadership descended from founding leader Kim Il-sung. The rally was held only 50 meters from the U.S. Embassy in Korea. The event involved speeches in which participants welcomed the young North Korean leader's possible visit to the South in advance. They underscored Kim's promise to come here during his September summit with President Moon Jae-in in Pyongyang and hung massive photos of the two leaders holding hands and a panoramic view of Mount Paektu. Among the placards were ones reading "We welcome Chairman Kim Jong-un's Seoul visit," and "Let's bring forward unification by implementing the agreements reached by the leaders of the South and the North." "It is a courtesy for us to welcome Kim, as President Moon was welcomed by North Koreans," said senior committee member Kim hang-sung. "It is good for peace and unification of the Korean Peninsula." 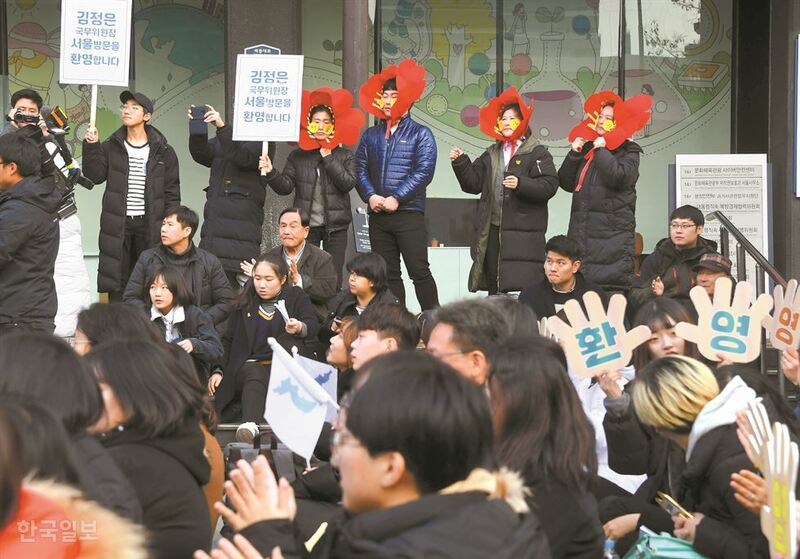 Some participants wore flower-shaped masks and wore stickers reading "Seoul," "visit," "fervently," and "welcome" on their cheeks. During the speeches, seven participants, including four college students, shared what they thought of Kim and how his possible visit would contribute to inter-Korean relations. "My first thought was that he has a really good voice," said a Hongik University student surnamed Koo, referring to Kim's New Year's address at which he proposed reconciliation after carrying out a series of military provocations a year ago. "I believe what we saw on television is Kim's genuine character," Koo said. A Kwangwoon University student surnamed Lee said, "Everyone should welcome the visit of North Korea's supreme leader, because praising and encouraging inter-Korean relations will take us to unification." A Sungkyunkwan University student surnamed Kim accused the U.S. of "preventing Kim's visit," saying, "The U.S. has been separating the South and the North and Kim's trip will prove how we can overpower the U.S."
Another student surnamed Choo said Kim's New Year's address was "full of his thoughts to resolve the people's issues in an autonomous and self-reliant manner." The speeches were followed by artistic performances, including a play in which the actors and actresses criticized conservative lawmakers for opposing Kim's visit and called for "a unified effort" for peace. Another play was about Naengmyun (cold noodle) and taedonggang beer that gained public attention in Seoul during Moon's Pyongyang visit. The audience chanted and cheered as the actors sang a song about delicious North Korean food. At a separate rally also held at Gwanghwamun Square, 10 anti-U.S. activists, including a pastor, held a prayer meeting. They called for "kicking U.S. imperialists out of the peninsula" while protesting against the U.S. Terminal High Altitude Area Defense (THAAD) battery in the South. "The U.S. is only asking North Korea to denuclearize without mentioning a peace treaty at all," said the pastor, whose name was withheld. "The U.S. should declare an end to the Korean War if it deems the South as its ally. Otherwise it is merely plotting to separate the two Koreas forever." Some conservative activists organized a rally protesting the pro-Kim rally. "I don't understand how they can advocate Kim and not denounce him," one protester said. "Kim has no intention of giving up his nuclear program and those pro-Kim activists are committing treason. The rallies should be stopped immediately." Meanwhile, the Ministry of Unification said on Nov. 19 that Kim could visit the South within this year, despite little progress being made in the Washington-Pyongyang talks on denuclearization. "We will make preparations to ensure that the agreements that the South and the North agreed upon, including Kim's trip to the South, take place without a hitch within this year," ministry spokesman Baik Tae-hyun said. "I hope that progress in the denuclearization talks can help speed the peace process on the Korean peninsula." Regarding the talks between Washington and Pyongyang and their impact on Kim's possible Seoul trip, he said, "It is a matter that needs to be worked out by those countries." Chung Dong-young, chairman of the liberal Party for Democracy and Peace, said the National Assembly should arrange a speech for Kim if he visits Seoul. Chung, a unification minister during the Roh Moo-hyun presidency (2003-2008), visited the North. "Kim's declaration of denuclearization and a new vision of state strategies in an address to the National Assembly will mark a turning point on the peninsula," Chung said at a party leadership meeting. "The issue was discussed during a dinner meeting between National Assembly Speaker Moon Hee-sang and leaders of five major political parties on Nov. 16 and conservative opposition parties didn't express negative or opposing views on Kim's parliamentary speech." Chung said the North Korean leader should keep his promise to visit Seoul, saying it would also be beneficial to the North. Twenty-four members of the Jeju provincial council presented a motion for a resolution calling for the leaders of the two Koreas to visit Mount Halla together. The measures came after President Moon said on Oct. 28 that he could climb Mount Halla on South Korea's southernmost Jeju Island with Kim. Paektu and Halla are the tallest mountains in their respective countries. Political sources believe Kim's possible visit to Mount Halla will facilitate cross-border reconciliation.